Where have the Menik Ganga Waters Gone? 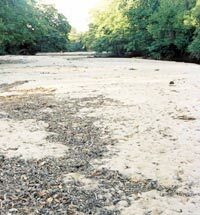 The Menik Ganga in the South East Dry Zone (SEDZ) has gone dry and Kataragama that very popular pilgrim resort has to be supplied with water by bowsers. The Menik Ganga, once the lifeline and living spring of the deep south, has run dry with the parched riverbed giving a grim testimony to the worst-ever drought that has thrown hundreds of thousands of people into starvation and suffering. The Kirindi Oya in the same region too has failed to meet the Lunugamwehera water needs as planned. To meet this shortfall, there was a much publicized water diversion proposal — Menik Ganga water to Kirindi Oya. Both these rivers are in the SEDZ, but Menik Ganga is drier than Kirindi Oya, as the former is in the drier region, more towards the east. In water resources planning, and especially in this case, Water should be diverted from west to east (wet to dry), and not from east to west (dry to wet). The	Government entrusted a team of professionals to prepare an Environment Impact Assessment report of this proposal. In fact, the team consisted of highly competent local experts and the task was really that of an expert technical committee. Thus the report produced was a review technical report and was by no means an EIA report. I was a member of this team. The review-report raised serious objections to the proposal. The main objection was that, since the water requirements of	the Menik Ganga basin are many, there is no surplus water for diversion to another basin. Today we see how correct the objection was. The people must have seen in the recent TV news story, the trickle of water flawing in the Menik Ganga. Water was being supplied by bowsers and tube wells were being bored to supplement this scarce and inadequate water supply. Thus we see the acute water shortages in both Kirindi Oya and Menik Ganga. I would like to refer here to another lop sided master piece of planning by our	pundits. This is to set up a power scheme with the Kukule (Kalu Ganga) water and after having generated a little electricity, all this water will have to	be sent as waste to the sea because at this low discharge level from the power plant, this water cannot be used for any other useful purpose. This plan is	being pursued overlooking the crying needs of the people in the south who are	suffering desperately for lack of water. I have pointed out very strongly for a long time, that this Kukule water should be diverted to the SEDZ (see my article "Short Sighted Water Resources Planning"	in the Sunday Island — August 17, 1981). Many senior Irrigation Engineers too are of the same view. Sometime back, there was a seminar on this subject by the Irrigation Dept. Practically all the Engineers and Scientists stressed the	need for the Kalu Ganga diversion, to the SEDZ. I have read many enlightened articles on the Kalu Ganga diversion by M. S. M. de Silva, a very experienced Civil Engineer who was active from the time of the Gal Oya Project. A study made by the Engineering Consultants Inc. of Denver USA in 1960 recommended	the diversion. A few years ago TAMS, New York was assigned to make a water	resources development plan for Kalu Ganga. Their recommendation laid stress on the diversion. But after that, for some unknown hidden reason, a second report had been prepared recommending a hydro power scheme. The first diversion report was conveniently or deliberately forgotten and consigned to the waste paper basket. A feasibility study is now being made by three consulting engineering foreign firms for this hydro power scheme. If this scheme is implemented, Kalu Ganga water will never reach SEDZ. This is certain. That means Ruhuna will not have water and it will never be developed. Why are the Members of Parliament (the representatives of the people) ignoring the needs of the people? When the Kalu Ganga has the largest flow in Sri Lanka, even greater than the Mahaweli, the population in the dry, south east region need not suffer in this manner for want of water. If the hydro power option is adopted, there is no alternative, other than to send this great body of water to the sea. No other use can be made of it. It is an unpatriotic act, a national calamity, to discharge this large flow of precious water, the life blood of Southern Development, into the sea, having utilized it only to produce a small quantum of power. The wise planner should realise that while power can either be imported or produced from other sources, with water this simply cannot be done. It should be noted that the small amount of electricity which this ill-fitting hydro power scheme can generate, can be easily produced by just two 40,000 ton coal shipments per year. Is the planner failing in his role as a Development Engineer, since he has lost sight of, and is insensitive to the predominant needs of the people which will provide them with a better quality of life? By this callous attitude, is he laying the foundation for the third uprising in the South against the Establishment? The Mahaweli Scheme was fortunate to have gone through a logical planning process. Today some of the foreign consultants employed, merely carry through what the local authorities desire and not what is best. If the local authority wants a plan for a hydro power plant, they prepare the plan accordingly, irrespective of whether it is a wise plan or not. If they are asked to prepare a plan for a 100-storeyed skyscraper, then they will do that too and collect their fees. It is due to the absence of the coal power plant which was sabotaged by the environmentalists, the CEB, in its search of power is now getting plans drawn up for a hydro power scheme with Kukule water. Moreover, it is to be a run-of-the-river plant without a reservoir, because there is no place for the resettlement of the people. On the other hand, if the diversion were to go ahead, the people could be resettled in the area to be newly developed. By adopting a run-of-the-river plant for Kukule, energy-Gwh which is a vital requirement in the present power system, now already overloaded with hydro MWs, will be practically halved of its available hydro power potential. Also, during the dry season, about four months in the year, the performance of this run-of-the-river plant will be poor. Thus, in this case, thermal power will also be required and hardly any sensible purpose will be served by implementing the Kukule (Kalu Ganga) hydro power scheme. There is another strange proposal to divert Uma Oya water to the SEDZ when, in reality, this water should be sent to the Eastern Province to relieve the water shortages in that region. This plan is immoral, because, it robs the water due to the Eastern Province. So, this is not only a foolish proposal, but an unethical one. It is more so, because the unutilized Kalu Ganga with a large flow equivalent to 1-1/2 times that of Mahaweli, is readily available for diversion. Instead, the present plan is to have a run-of-the-river hydro power plant and send all that water waste to the sea. What is this diversion after all, when in North West India a 700 mile long Indira canal is now being cut and there is even a proposal to cut a canal from North India to South India for water diversion? All this because water is so precious a commodity. We only quote King Parakramabahu: "let not a drop of water be sent unutilized to the sea". But here we act so foolishly. The clamour today is to save the scarce natural resources. This can be best done by diverting Kalu Ganga to the SEDZ and not by having a run-of-the-river hydro power plant at Kukule. In the light of the above, may I suggest that the Government arrange to get an independent review of this subject, as was done for the proposed Menik Ganga diversion to Lunugamwehera or as the Mahaweli Plan was studied and implemented. In my plan where the development of SEDZ and the balanced development of the nation are considered, the Government should give priority, to the Kalu Ganga diversion to the SEDZ and a feasibility study of the Mawella Coal Power Plant, in addition to the Trinco Coal Power Plant now taken up for implementation.